Thursday 4th March was World Book Day and everyone dressed up as book characters. Members of the Junior School watched World Book Day authors reading online. These authors included Kaye Umansky, Darcy Bussell and Dan Freedman, not forgetting the Fat Controller from Thomas the Tank Engine! We raised around £70 to send to Book Aid and will also be sending the senior’s book mark designs to enter into the national competition. Mr Colin White, Head of Maths here at St Joseph’s, is holding the letter inviting him to be Chief Examiner for OCR Specification B. Colin is already Principal Examiner for this specification and now he will be responsible for the quality of all the examination papers for this specification as well as setting the Higher paper throughout the World. Well done Colin. On Tuesday afternoons the year 10 and 11 pupils take part in a fitness session led by Launceston Rugby Team member Ryan Westren. The idea is to enhance and promote levels of fitness within the pupils. They are all working very hard and although on occasions getting muddy they are determined to achieve what Ryan has set them to do. It has been fantastic to watch pupils working so well and getting fitter over the last 3 weeks. The sessions will run over the next half term so that all the pupils will have time to increase their endurance. Keep going everyone. Over £1000 pounds was collected in one day at St Joseph’s School when Senior and Junior pupils joined together to raise money for the victims of the devastating Haiti earthquake. The day was planned by the pupils who came to school in mufti or fancy dress in return for giving a donation to the appeal. The parents and pupils also made cakes and biscuits which were sold during the morning break and this added to the amazing total raised. The £1151.35 has been donated to the Shelter Box Appeal which is actively involved in the rescue and rehabilitation of the many children and adults who are without food, water and shelter in the earthquake area. 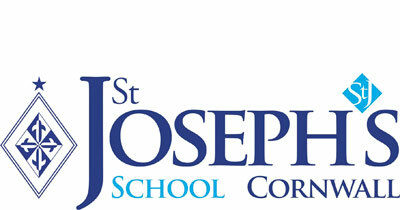 It is hoped that the money from St Joseph’s will enable two more fully equipped boxes to be sent to Haiti.